Store: A dedicated full-screen space the user can access anytime from the navigation. The available content is displayed in a grid and issues can be previewed. An optional banner display lets you promote issues, subscriptions or a web site. Library: A dedicated full-screen space the user can access anytime from the navigation. Issues are displayed in a grid. Thumbnail scrubber: Now shows the issue and the vertical names. There is also a scrollbar that allows users to quickly navigate through an issue. Top navigation bar: Re-designed with options for customization, including a branded color and logo at the top. Menu accessible with single tap on screen. The current long-press and two-finger push remains functional as well. Social sharing via Twitter or e-mail: Sharing can be enabled or turned off for an app and will include both a thumbnail of the vertical being shared and a customizable URL that can point to the app in the App Store or to a URL. Read more about the new sharing feature in the Plug-in manual located here. If you have embedded audio files in the MIB, the user will be able to play and pause them from anywhere in the issue through a pop-down audio player in the navigation bar. A-layer only: Check the ‘No B-layer’ option in the Plug-in, and your vertical will be a scrolling A-layer only; double-tap will be inactive. New Feature Builder options: Web feed renderer and additional slideshow options. Top banner is customizable, so you can have your own branding! The Plug-in has been updated to support the new app functions, including audio player, no B-layer, preview and social sharing. It is now also possible to choose Photoshop resampling preferences for specific objects. 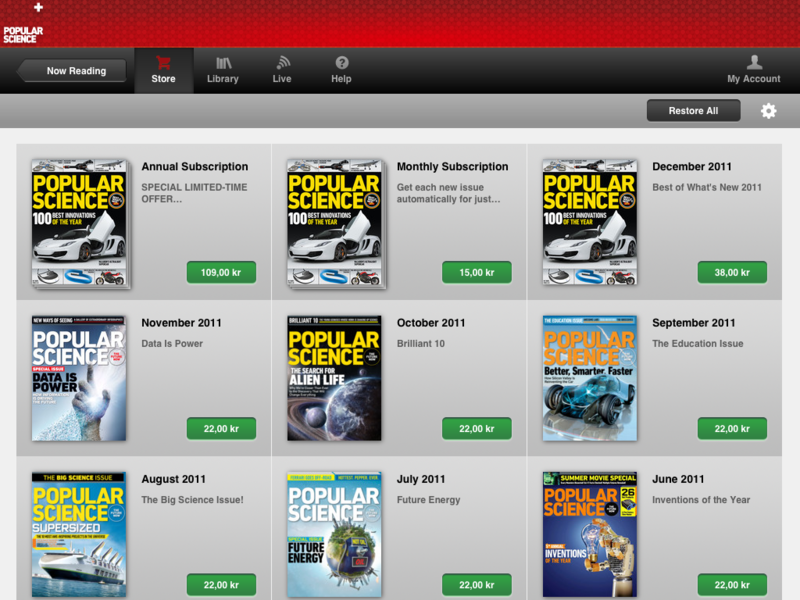 You will find all the details for the new functionalities in the Mag+ Plug-in Manual located here. Also keep an eye out in our forum for upcoming video tutorials demonstrating the new features. There are no visible changes to the Mag+ Production tool. Minor changes have been made behind the scenes for better performance. The possibility to create an Android 3.0 app for 10-inch tablets like the Motorola Xoom and Samsung Galaxy Tab. You will be able to use the same MIB for both Android and iPad if you follow our Android guidelines. Options for setting up new app functions and customization. Rearranged choices for better usability. Server upgrades for higher download volumes. If you are new to Mag+, start you journey with us by registering here. If you already are a Mag+ user you will have to remove your current installation before installing 3.0. Uninstall InDesign Plug-in: Go to the Adobe InDesign folder on your hard drive and delete the Mag+ folder in the ‘Plug-ins’ folder (e.g. MagPlus CS5 v2.5.1 Mac). Uninstall the Production Tool: Find the application MAGProd under Applications/Programs and delete it. Go to magplus.com/update to download the 3.0 installation bundle. Also see our installation guide. If you have a previous version of the Mag+ reviewer installed on your iPad you will get an update notification in order to upgrade your app to the latest version. For each issue an additional ”Store and Newsstand” icon needs to be submitted. This icon is used to provide an image for Apple Newsstand, the Store and the Library in both the iPad app and the Android app. The Image must be a .png file, at least 72 DPI, a minimum of 768 pixels on the long edge and must have an aspect ratio between 1:2 and 2:1. Also the artwork must be flat with no rounded corners. If your app is in any other language than English, there are new applicati0n texts that have to be translated. You can update those texts under (Apps/iPad/Application Texts). Full list of new texts here. (Optional) Logo icon. The menu has an optional logo image that can be enabled in the options . The picture should be 60 pixels high, max 1024 wide (Apps/Navigation Icons/Logo icon). (Optional) Add one to four promotional banners to your store; must be 948 pixels by 300 pixels (Apps/Live Settings/Banners). (Optional) Tint color, An RGB color for styling of certain elements in the app such as the background of the slider. (Apps/iPad/Build options). (Optional) Any or all icons in the navigation bar can be customized (Apps/iPad/Navigation icons). With the release of 3.0 we have made an update to enhance the handling of hotspots located on different layers. Before it has been possible to tap on hotspots even if the objects they were anchored to were not seen by the user. Now the app checks so that the object the hotspot is anchored to (for example a button) is visible for the reader. This means that if the object the hotspot is anchored to is transparent it will never be active because the app thinks it is not supposed to be. This only affects 3.0 mibs. Hotspots in 2.5 mibs will work as they always have in 3.0 apps. Dual orientation – the current version of the Android app only supports landscape publications. Please make sure your issues support landscape, they may also support portrait, but may not be locked to portrait only. Menu customization – it is not possible to customize the navigation icons in the menu. Language customization – the Android app only supports English for the different messages that appear in the app. 3rd party services for Tracking, Analytics and Ads – none of the 3rd party services that are available for the Mag+ iPad app are available in the Android version (AdMob, Flurry, Localytics, Omniture, TapJoy). In-app purchases of subscription are not available.